Take aim at the world's best commercial real estate investments. Looking for off-market opportunities? Brevitas has the largest select of private inventory available online. Over 30% of listing on Brevitas are only available to verified investors. Gain access to a global network of property brokers, agents, and consultants. Brevitas hosts listings in over 60 countries and gladly welcomes members in over 80 countries. A powerful algorithm instantly connects you with investment opportunities of interest. Through the power of machine learning and detailed data science, Brevitas is able to match investment opportunities to your criteria with unmatched speed and accuracy. See listings for sale on Brevitas first, then seize your next opportunity. 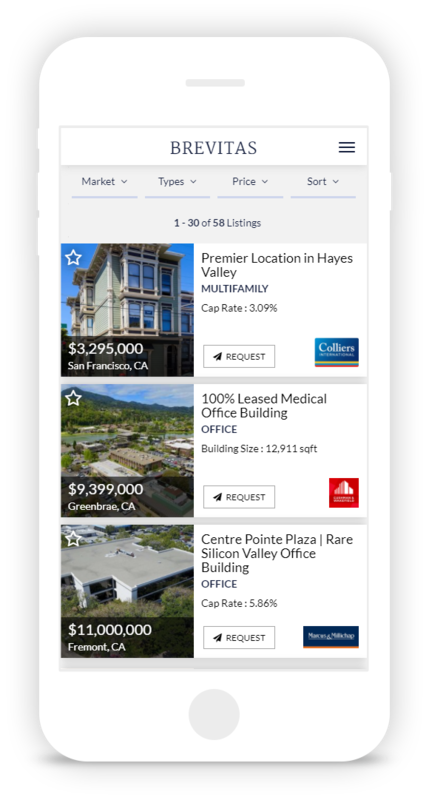 Instant alerts on Brevitas will match new inventory to your investment criteria. Easy to use dashboards offer clear visibility into your market activities. Allowing you to stay on top of your new acquisition targets and close faster.